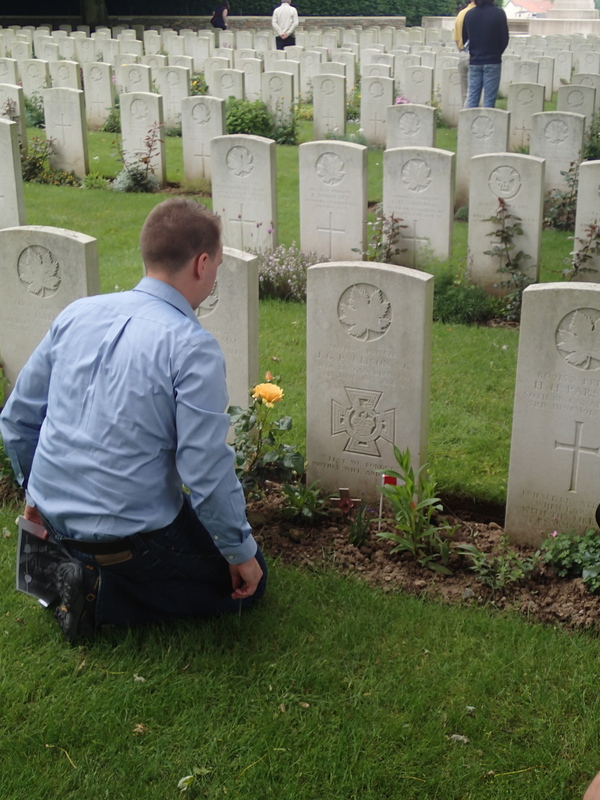 June 1, 2014 – Today we visited Vimy Ridge. What an experience! Having read and heard about this battle, it was something else altogether to see it in person. Soaring out of the ground on Hill 145 and overlooking the Douai plain, it is truly a sight. However, it is also very sobering. 10,000 Canadians fell trying to take this ridge, a cost which cannot be forgotten and is not when you visit the site. In my mind’s eye, I could see the thousands of Canadian soldiers charging through craters, barbed wire and blasted landscape to take the hill. I also had the opportunity today to visit La Chaudière Military Cemetery, where the soldier I researched is buried. Private John George Pattison, who won the Victoria Cross for his actions during the taking of Vimy Ridge on April 10th, is the soldier I researched. He died during an assault on a power plant in Lens, France on June 3, 1917. Being there and seeing his grave, it brings home the fact that he was a real person. His story for me is all the more impactful as I am on the cusp of becoming a father, and John George Pattison joined the Canadian Expeditionary Force (CEF) to protect and watch out for his son Henry. Seeing al of these maple leaf crested headstones, reading the names, inscriptions and ages, the magnitude of Canada’s sacrifice in the Great War comes into sharp relief. Confronted with the reality of the war up close and personal, I was moved to contemplate and reflect. In reflecting I realize what a different time these sacrifices were made in, as John’s wife Sophia proudly wore his Victoria Cross when she met King George VI in 1939. I did not find records of her being bitter and angry at his death, although I am sure that she mourned greatly. However, my impression is that while she mourned his death, she understood his sacrifice, something I do a little bit more after visiting his gravesite.